UN sues for peace, diplomacy in Nigeria – Royal Times of Nigeria. 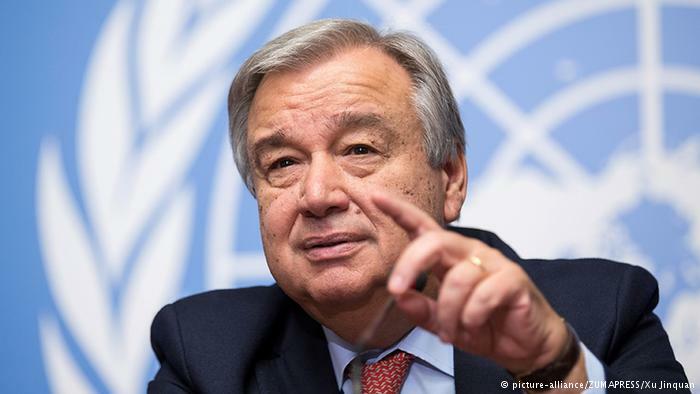 The UN Secretary-General Antonio Guterres, has called for a surge in diplomacy for peace and for a new emphasis on preventing conflicts in Nigeria and the world in general. The Secretary General was quoted as saying this in a message to the Lagos Model United Nations (LMUN) 2017 organised by the University of Lagos (UNILAG) in collaboration with UNIC Lagos. Guterres’ message was delivered by UNIC Lagos Knowledge Management Assistant, Ms Bolanle Olumekor. The LMUN with the theme, “Innovation, Development, and Diversity for Global Sustainability” was attended by 200 delegates from 14 Universities in Nigeria and the United Kingdom. “We are also working to improve living conditions everywhere through the 2030 Agenda for Sustainable Development. “All parents want a better life for their children. All religions value peace. All communities thrive when they value diversity. “Today people around the world are inter-connected. Conflict, environmental destruction, poverty and injustice affect everyone. We have to work in common cause for our common humanity,” Guterres said. He urged the delegates to follow the UN social media accounts and stay fully engaged in their communities. “Together, let us create a more compassionate, inclusive and peaceful world,” he said. The Minister explained that simulation in communication skills, diplomacy, public speaking, resolution writing, international law and politics as well as trade relations would assist in understanding the overall objectives of the UN. He said that it would also assist in understanding its rules of procedure and its modus operandi, adding that the future of Nigeria and the world rested in the ability of the delegates to succeed in reinventing the wheel positively. He said that this was also “to actively challenge old traditions and models that do not necessarily translate into this era, to explore the ways they can marshal the amount of time spent with technology for good”. The Dean, Faculty of Law of UNILAG, Prof Ayodele Atsenuwa, thanked the UNIC and other partners for ensuring the success of the event. Atsenuwa emphasised the commitment of the student-organisers for their drive. The Secretary General of the LMUN, Mr Aliu Gabriel, in his message, urged delegates during committee sessions to foster innovative ideas towards addressing some of the prevailing issues around the world.